A strange thing happens to me once the weather finally starts behaving. I feel this ludicrous need to clean, re organize and cook with lemons. I bought a huge box of Meyer lemons from Costco and they were calling my name on Saturday as the temperatures soared to around 13 C outside. I started preparing the lemons by turning on some tunes. First I zested each lemon, then juiced it using my new juicer. From all those lemons I got about half a cup of zest and about 3 cups of juice. Definitely enough to make a Lemon tart plus some other fun stuff, like Meyer lemon syrup for cocktails. So far I’ve had a few failed but delicious attempts at making a lemon tart. 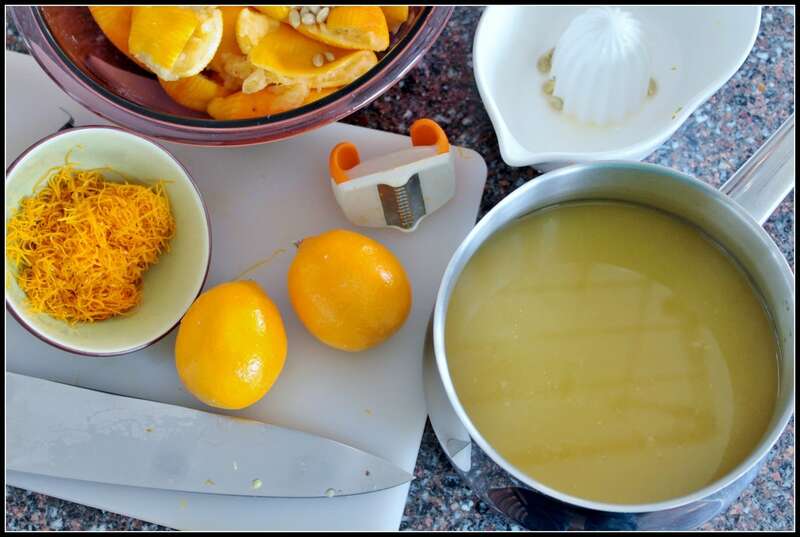 I had a Bellini Kitchen Master to demo for a good long while and I used it to try and make some lemon curd. I say tried because none of the curds I made with the BKM were able to set in a tart shell. We ate the seeping tarts anyway so it wasn’t much of a loss but it was still very frustrating. 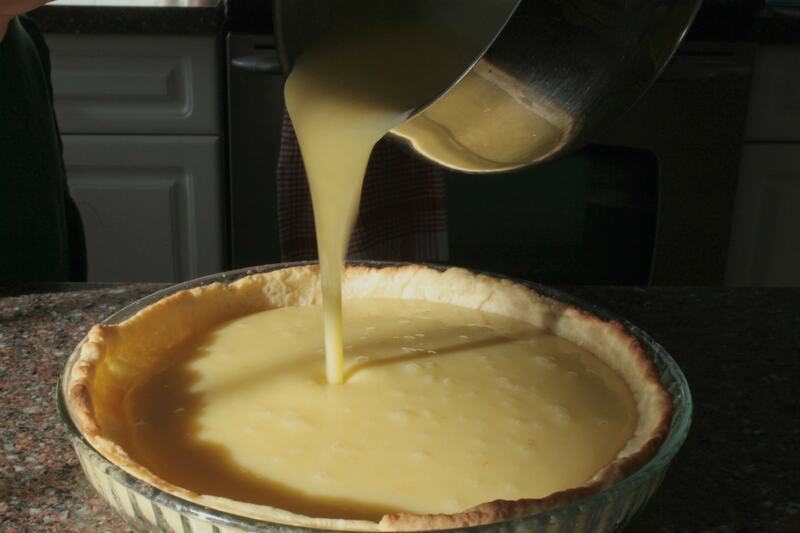 I am a huge lemon tart fan so really that is one thing that I wanted to master. 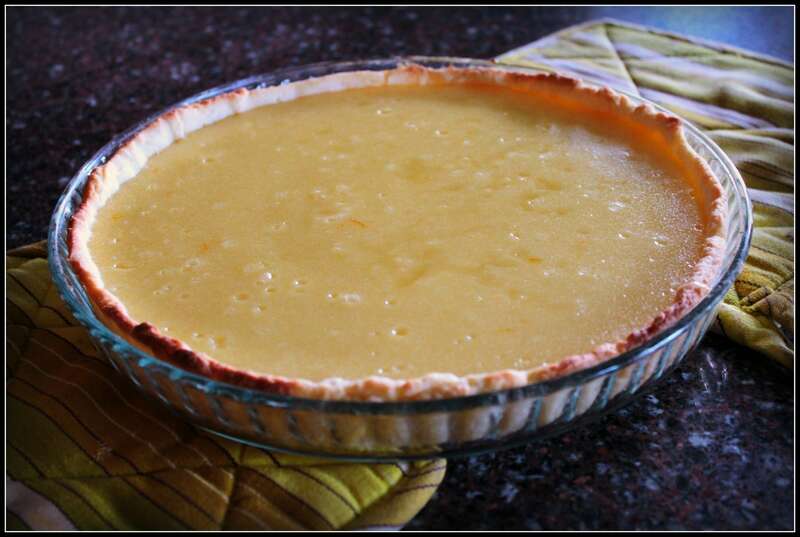 How nice would it be to have company over and have a dependable lemon tart recipe to wow them with? Well, I did some searching online and found this Meyer Lemon Curd Tart recipe on the Food Network site, courtesy of Anne Burrell. She’s the woman chef with the really over the top crazy wild blonde hair that I cannot stand. I had reservations…but then I read the reviews and decided to give this recipe a go. I began by using my new food processor to make the pastry according to the steps in the recipe. This is the first time I’ve made pastry in the food processor because I usually use my mixer. I was gobsmacked with how easy it is! Why oh why would anyone want to make pastry by hand if they had a food processor in their kitchen? The pastry turns out so nice and it only takes you maybe two minutes. Once the pastry was made I put it in the fridge to rest for a while, then rolled it out and gently placed it in the tart pan. I lined it with aluminum foil and filled it with dried chickpeas. I baked it at 425 F for around 12 minutes, then removed the peas and foil and baked it for another 6 minutes. I maybe should have baked it a bit more but the original recipe only asked for 3 minutes so I was worried I would over bake it. While the shell was baking I had kid number two come and help out with the curd. I wanted to be able to take pictures and focus on making sure that shell didn’t burn. At first I had the curd set in a bowl, double boiler style but then she went to read the recipe and discovered that we needed to pour it directly into the pan. Recipe save by kid number two! She did some whisking while I took the pictures. It turned out fabulous! We were fighting over the leftover pieces the next day. Note to self: next time cut the tart into 10 pieces so everyone gets an equal 2 pieces! Put the butter, sugar, flour, egg yolk and salt in a food processor and pulse for 30 to 60 seconds or until the mixture has a grainy consistency, or what I like to call the “Parmesan cheese” stage. Add half of the water and pulse the food processor 2 to 3 times. The dough should start to come together, add the remaining water if needed. Check the consistency of the dough by clenching a small handful in your fist. If the dough stays together it is the proper consistency. If not, pulse the dough with a little more water. When the dough has reached the proper consistency, dump it out on a clean work surface. Using the heel of your hand, schmear the dough straight forward and roll it back with your fingertips. Repeat this process 1 to 2 more times, dust with flour if needed. Form the dough into a disk, wrap in plastic wrap and refrigerate for at least 30 minutes. On a lightly floured work surface, roll the dough out to 1/8 to 1/4-inch in thickness. Lay the dough in the tart pan. Push the dough into the sides of the tart pan by rolling a small scrap of dough into a ball and pushing it into the dough. 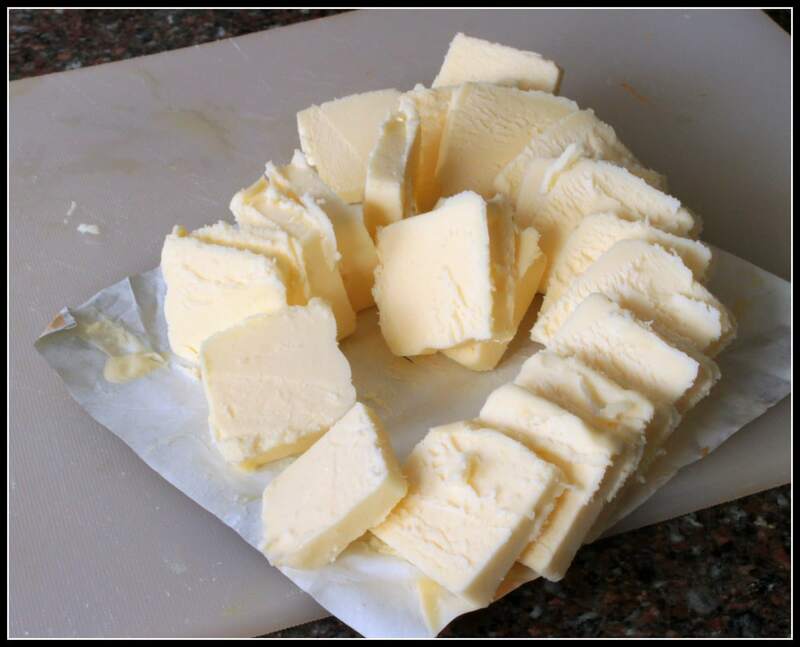 Roll over the top edge of the tart pan with the rolling pin to cut the extra dough from the pan and create a crisp edge. Cover the dough with aluminum foil and gently poke the foil into the side edges to fit the pan. This will help to keep the sides of the tart tall and straight as it cooks. Fill the tart shell with the dried beans and place in the preheated oven. Bake for 10 to 12 minutes, remove the foil and beans and bake for 2 to 3 minutes more. Remove the tart shell from the oven and cool. The dough should be golden and crisp. 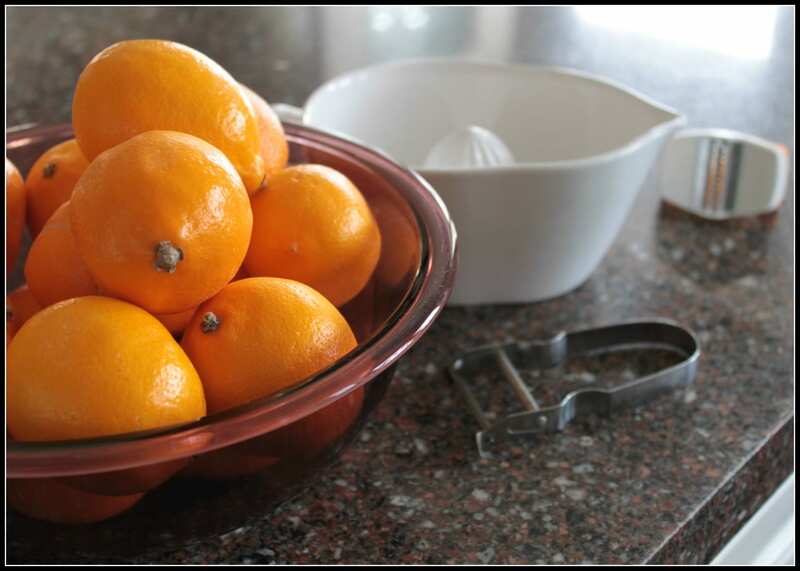 In a bowl, combine the lemon juice, zest, sugar, eggs and salt and whisk to a homogeneous consistency. 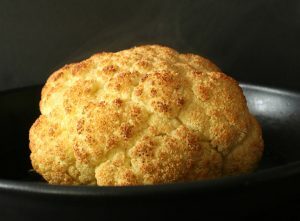 Place in saucepan and bring to a medium heat. 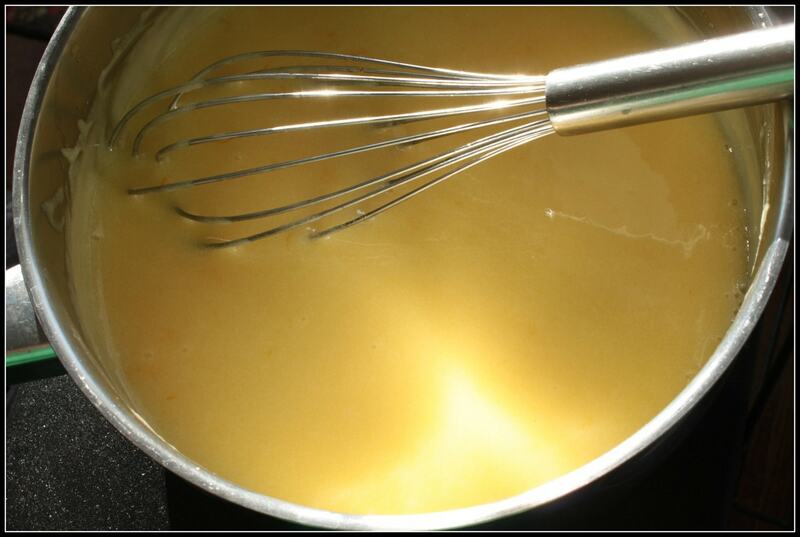 Cook, whisking, constantly until the mixture has thickened, about 12 to 15 minutes. 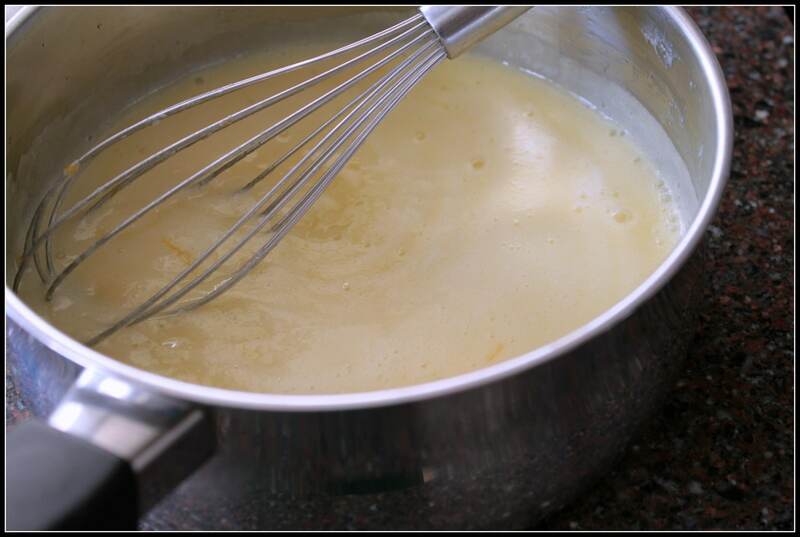 Remove from heat and whisk in the butter, 2 pats at a time until it’s incorporated and has a silky consistency. One dessert I do love is a good lemon tart. I do confess I prefer a baked tart but this little puppy looks damn fine my friend. I would’ve been in the tussle for the final piece for sure! 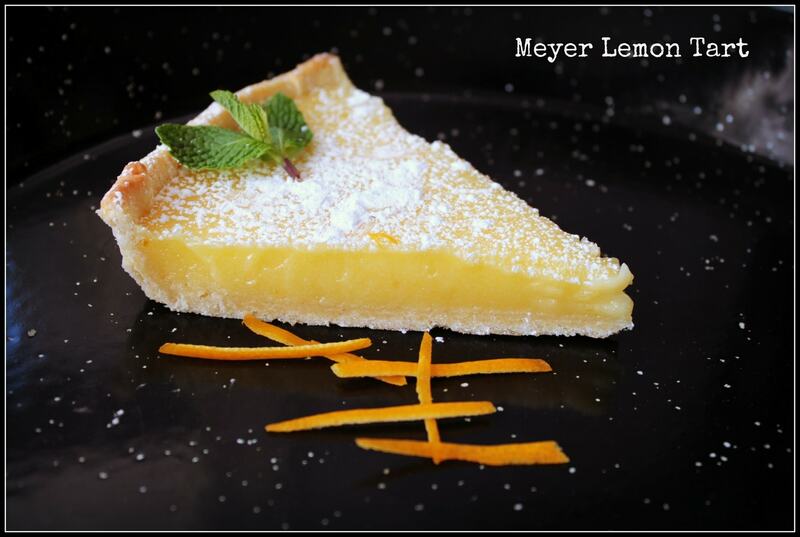 I love Meyer lemon anything! I’ve had mixed results with my filling; the last time it didn’t set. Glad you shared it on the FBC group, I pinned it. Your recipe looks amazing! Thanks for the share. Let me know if you do end up giving it a try.